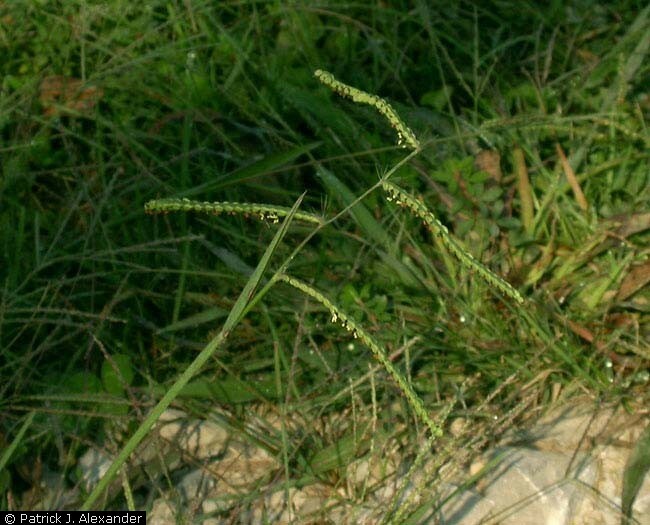 Paspalum laeve .Patrick J. Alexander @ USDA-NRCS PLANTS Database (Accessed 5/2014). Paspalum laeve var. pilosum is a perennial grass 30-80 cm tall, usually several stems together, sheaths keeled, mostly loose, hairy. Leaves mostly crowded near base of plant; blade 5-25 cm long, 0.3-1 cm wide, hairy. Flower spikelets 1-flowered, about 0.2-0.3 cm, egg-shaped, flat on front side, rounded on the back, in two rows, crowded and overlapping on one side of the axis, inflorescence of 2-6 spike-like branches, 4-12 cm long; blooms and fruits July-Oct. Frequency in NYC: Rare. (G4, NYS S1, E), possibly extirpated. Habitat: Damp sandy soil, fields, shores, soil pH 4.5-7.5 (USDA, NRCS 2010).